Happy Friday Friends! I hope you're all having a great week and headed off somewhere fun for the long weekend. I'll be in the city soaking up the extra day off and catching up with friends. 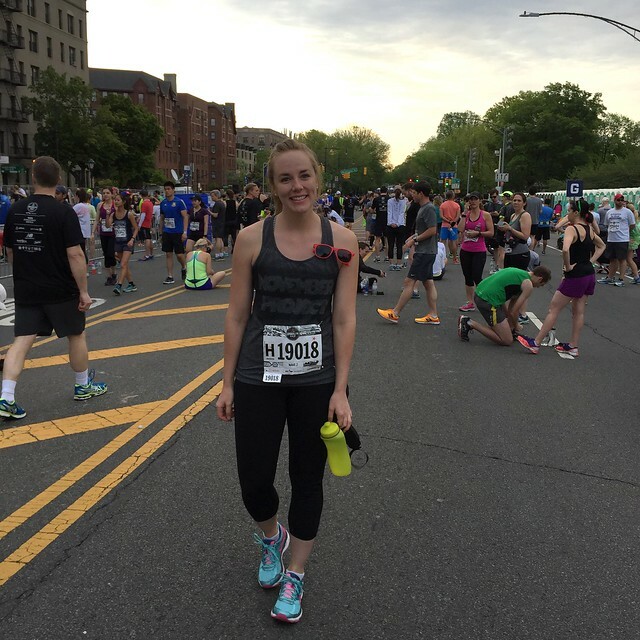 Today I wanted to recap my Brooklyn Half Marathon experience. Bare with me because it's a long one! If you recall from last week's post the week leading up to the race was less than ideal so I was a little nervous going into the race. I decided to stay focused on the fact that I was doing this for fun - no time goals but rather a goal to just finish and to finish happy. I was in wave 2 with a 7:45 AM start time but I cabbed to BK with a friend who was in wave 1 (versus taking public transit which would have had me leaving my apartment at the crack of dawn) so I arrived at 6:00 AM which was ridiculously early for my wave. I planted on the steps of the Brooklyn Public Library, ate my breakfast of Justin's almond butter and whole wheat English muffin (ps - the little Justin's squeeze packets are LIFE SAVERS). I had a banana when I left my apartment but purposefully put off eating breakfast so I wouldn't be starving during the race. I found my NP start crew and we made our way to the corral. I peed twice while waiting for the race to start and still had that nervous pee when we started - sorry for TMI! I don't think I'll ever get over that feeling but if anyone has any ideas on how to overcome it, I'd love to hear! 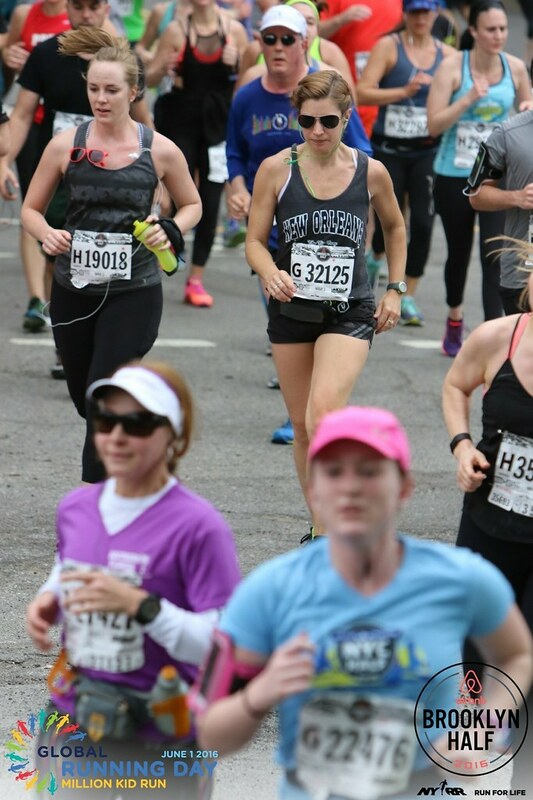 My RBF and I had decided to pace each other through most of the race to make sure we didn't go out too fast and we stuck together for the first 9ish miles. We started off quick on the downhill but kept everything scaled back for the next couple of miles. By the time we entered Prospect Park I felt like that first 5k flew by even with a nice little hill mixed in. When we started to climb the second hill and I tried to remind myself it would be no worse than the Harlem Hills in Central Park but by the time we reached the top we were both like "WTF was that!" I guess it was a little unexpected because we were cruising along at a 9:43 pace (remember most of my long runs had been at a 10:00 pace) . We passed the NP cheer squad which was the best little push! Coming out of the park I was feeling a little nervous about my knee because I was having some pains because of the hills and the pitch on the road. So thankful to be out of the park we cruised down to Ocean Parkway and knew we were on the downhill/flat stretch until the end of the race. I felt like I needed to get into my own groove so when Nina went for water I put my headphones in and just started to fall into a comfortable pace. 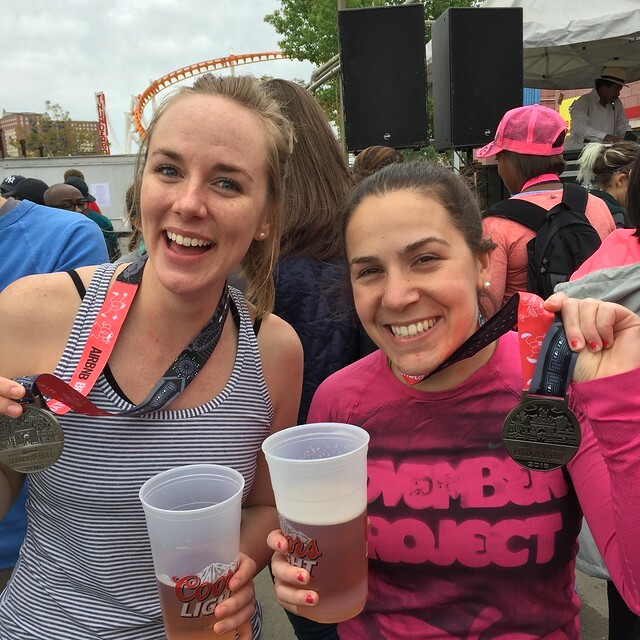 At mile 11 I started to get really excited and began to pick up the pace but tried to remember our team captain's pre-race email which told us to hold onto our kick until about the 20k mark (12.5 miles). I rounded the corner for the last stretch before the boardwalk and an NP friend was cheering me on yelling "pick it up, only 400M to go!" By the time I hit the ramp to the boardwalk my feet felt numb but I kicked it in until the end, despite the fact that I felt like I was going to vomit (I guess eating Stingers at mile 11.5 wasn't such a good idea after all...). I ran THROUGH the finish, took a deep breath before I almost tripped over someone (my legs were jello) and grabbed my medal. I looked at the time on my phone and had unofficially PR'd by 3 minutes (UPDATE: I PR'd by 4 minutes, running a 2:08 race. 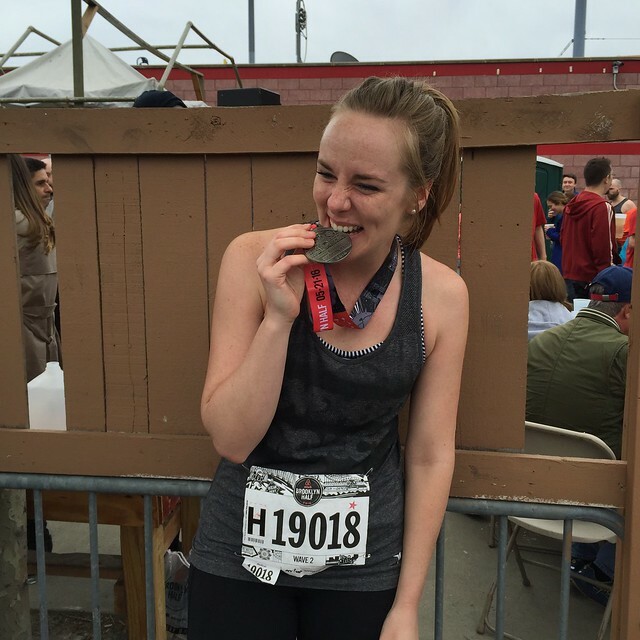 My last half marathon before this in 2012 was a 2:12 finish so needless to say I was SO HAPPY!). 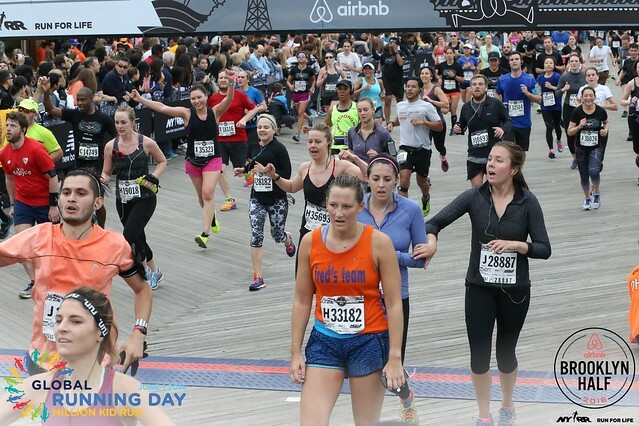 Our NP team captain always stresses to run THROUGH the finish - I definitely had my eyes on the prize here! From there it was off the pick up my bag, change my clothes and meet the NP crew for some beers, race stories and dancing. My body really felt great and the congratulations I received from my NP friends meant the world to me. Everyone knew how important this race was to me and knew I was coming off an injury so it made the celebrations that much better. After a solid 3 hours and 48 oz of beer later, I made my way to Bareburger for a post race burger and vanilla shake (my go-to post race meal), followed by a solid 2 hour nap (my new weekend mantra is #runhard, #napharder) and Thai food. TBH, I think one of my favorite things about running long races is the post-race grub and hot shower. Beers as big as my face. I had one over the course of 3 hours and was done haha. Now it's officially time to focus on triathlon training because we have 6 weeks and counting! Check in next Friday to see what I've been up to for Tri training!